OpenXT is an open-source development toolkit for hardware-assisted security research and appliance integration. 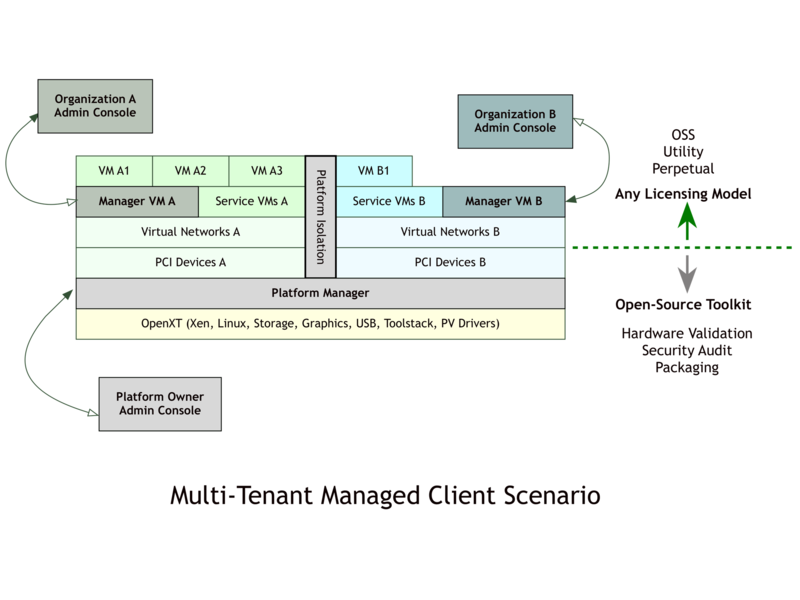 It includes hardened Xen VMs that can be configured as a user-facing virtualization appliance, for client devices with Linux and/or Windows guests. It has been used to develop managed software appliances to isolate demanding graphics workloads, untrusted workloads and multiple networks on a single laptop or desktop. OpenXT is optimized for x86 devices with Intel VT-d, TXT (Trusted Execution Technology) and a TPM. Client appliances developed on OpenXT can contain a mixture of open-source and proprietary software, supporting a range of business models. Development toolkit for hardware-assisted security research and appliance integration. Integrity measurement, virtualization, encapsulation and privacy.